Here are the latest TV ratings for The Game on BET. The sitcom that The CW once cancelled returns for another season of 22 episodes on cable. The cast includes Brittany Daniel, Coby Bell, Hosea Chanchez, Pooch Hall, Tia Mowry Hardrict, and Wendy Raquel Robinson. 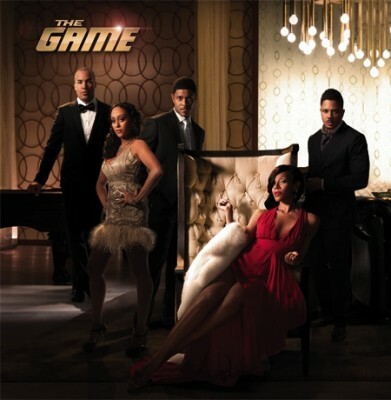 The fifth season of The Game airs Tuesday nights on BET. The TV show’s ratings for the 2011-12 season are the best way to tell if The Game is going to be cancelled or renewed for a sixth season. Final season five averages: 1.4 rating in the 18-49 demographic with 2.49 million total viewers. 1.3 rating (+18% episode-to-episode) with 2.49 million total viewers. Season average: 1.40 in the demo with 2.49 million. 1.1 rating (+10% episode-to-episode) with 2.24 million total viewers. Season average: 1.40 in the demo with 2.66 million. 1.0 rating (-9% episode-to-episode) with 1.99 million total viewers. Season average: 1.42 in the demo with 2.68 million. 1.1 rating (0% episode-to-episode) with 2.08 million total viewers. Season average: 1.44 in the demo with 2.71 million. 1.1 rating (+10% episode-to-episode) with 1.94 million total viewers. Season average: 1.46 in the demo with 2.75 million. 1.0 rating (-9% episode-to-episode) with 2.02 million total viewers. Season average: 1.48 in the demo with 2.80 million. 1.1 rating (0% episode-to-episode) with 2.11 million total viewers. Season average: 1.51 in the demo with 2.85 million. 1.1 rating (-8% episode-to-episode) with 2.19 million total viewers. Season average: 1.54 in the demo with 2.89 million. UPDATE: The Game has been renewed for season six. 1.2 rating (+9% episode-to-episode) with 2.25 million total viewers. Season average: 1.57 in the demo with 2.95 million. 1.1 rating (-15% episode-to-episode) with 2.02 million total viewers. Season average: 1.60 in the demo with 3.00 million. 1.3 rating (+8% episode-to-episode) with 2.52 million total viewers. Season average: 1.64 in the demo with 3.08 million. 1.2 rating (0% episode-to-episode) with 2.38 million total viewers. Season average: 1.67 in the demo with 3.13 million. 1.2 rating (-8% episode-to-episode) with 2.39 million total viewers. Season average: 1.72 in the demo with 3.21 million. 1.3 rating (0% episode-to-episode) with 2.45 million total viewers. Season average: 1.78 in the demo with 3.30 million. 1.3 rating (+8% episode-to-episode) with 1.71 million total viewers. Season average: 1.84 in the demo with 3.40 million. 1.2 rating (-20% episode-to-episode) with 2.41 million total viewers. Season average: 1.91 in the demo with 3.65 million. 1.5 rating (-6% episode-to-episode) with 2.82 million total viewers. Season average: 2.03 in the demo with 3.85 million. 1.6 rating (+7% episode-to-episode) with 3.20 million total viewers. Season average: 2.14 in the demo with 4.06 million. 1.5 rating (-29% episode-to-episode) with 2.87 million total viewers. Season average: 2.27 in the demo with 4.27 million. 2.0 rating (-29% episode-to-episode) with 3.64 million total viewers. Season average: 2.53 in the demo with 4.74 million. 2.8 rating in the 18-49 demographic with 5.29 million total viewers. Season average: 2.80 in the demo with 5.29 million. The return of The Game was strong enough to win its timeslot in the demo on cable and the broadcast networks as well. It was down from last season’s opener (7.7 million) but this was still very impressive. What do you think? Do you like The Game TV series? Do you think it should be cancelled after this season or renewed? The Game: Season Finale Preview; Will It Be Back? The Game: CW Cancels Sitcom, Still Hope for Season Four? The Game: Will the CW Sitcom Survive or Be Cancelled? I rlly love the Game and all of the actors.. but I don’t like wat BET has done with it.. when the CW had The Game.. it was better! I’m goin to continue watching it because I love seeing Pooch on tv.. but it is gettin worse. I agree. The Game’s not the same anymore. The Game isn’t even remotely about football anymore. And I hear it’s a spinoff of “Girlfriends” but I don’t see the connection. But if it’s renewed, which it will be, then four words: more comedy, less drama. The Game a spinoff from Girlfriends? Really? When? Where? How? T2U » An episode from April 2006 called “The Game” was a backdoor pilot for The Game. notice that every week ratings decrease? TG is not good. I watched ep 5 1 then stopped. the show is bufoonery, negative, stereotypical. I’m not so sure about “The Game” anymore. Derwin and Melanie were originally the focus, but now they’re more like supporting characters. Plus, the character of Melanie is too stuck-up now. And Tasha’s man problems are getting repetitive. Right now Tee-Tee and Jason are my favorite characters.The tone isn’t as drama-heavy as season 4, and that’s a good thing but I just haven’t been that impressed so far. I’m not happy with the show this season. We need Kelly back and a friendship bond. This season has shown that black people has some serious problem. If it did not get a new season I will not be disappointed. Please people we need to be seen in a more positive manner. I love it I watch it on the weekend. Because of school. Please don’t cancel. During the first three weeks they are bleeding serious numbers of viewers. Did this happen in season 4, and what was the average number of viewers in season 4? I think Season 4’s premiere was better than this year’s but it’s still alright. No , Jason and kelly need to be one, LOVE!!!!!!!!!!!!!!!!!!!!!!!!!!!!!!!!!!!!!!!!!!!!!!!!!!!!!!!!!!!!!!!!!! !